Copiapoa montana f. cristata hort. 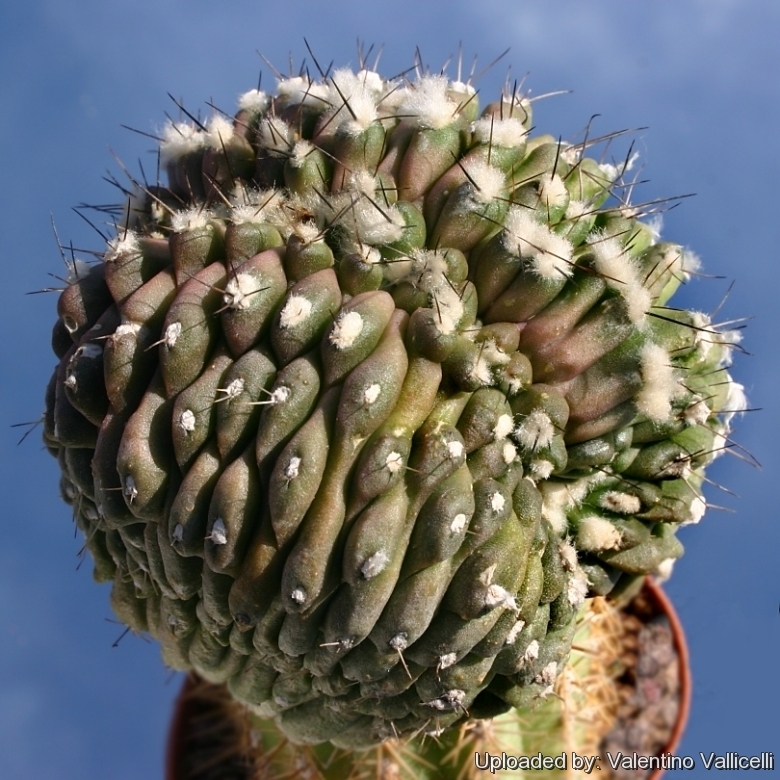 Description: This is the crested clone of Copiapoa montana. It is one of the more fascinating crested Copiapoa sought after by cactus impassioned. This cultivar is stable and remain crested. The standard species is a geophytic cactus arising from a large tuberose root that can slowly branch from the base to form moderately large clump. Stem: Fan-shaped 4-10 cm in width, pale green or olive green eventually lightly tinged with brown in the sun, and crowned by a dense mass of long white wool, particularly at flowering time. Ribs: Prominent, divided into large tubercles about 7 mm high. Areoles: Round 3-10 mm in diameter, 5-15 mm apart and covered with white or brown wool turning grey, later glabrous. Flowers: The flowers arise on the line crest, often several at a time, nearly hidden in the dense wool. They are glossy, pale yellow, with broad limb, 5.5 cm in diameter, and with a faint scent. Blooming season: Flowers intermittently throughout the whole summer.